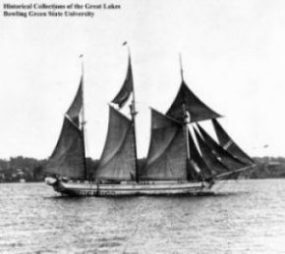 Built and launched in 1883 at Manitowoc, Wisconsin, the Emma Neilsen was a three masted schooner with a length of 75 feet, a beam of 20 feet and a gross weight of 63 tons. She served the Great Lakes proudly for nearly three decades, supporting the shipping and commerce industries in the area. In June of 1911, while captained by William Young of Port Huron, Michigan, the Neilson collided with the steel ship Wyandotte while crossing a fog bank at 2am. With her bow crushed and sinking fast, the captain and crew quickly abandoned the Nielsen to the mercy of the depths. Today, she sits in 190 feet of water and is an amazing wreck for trained and equipped technical divers to explore. We visit the Emma Neilsen from Harbor Beach on the Go-Between.